LINEAR WORSHIP VS. INSTITUTIONAL WORSHIP: WHAT HAS HAPPENED TO SPONTANAEITY? Linear worship can be done in an institutional setting, but only if the leadership of the institution is willing to “give up” control to the Holy Spirit, and be wiling to take the chance that it might just look as if it is “out of” control while being willing to be an integral part of the worship experience as a just a horizontally relational peer. I don’t know if you noticed, but the worship scene at most churches has become stagnant. Even though drums, electric guitars and basses with a worship leader and several background singers have replaced organs and choirs, church services have become very predictable. 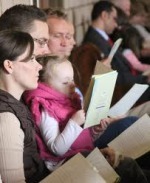 Even though the church may not print out a bulletin with “order of worship” in it, opting for it now being just an advertizing piece of literature of church activities, events, and services, if one attends that church weekly, it will not be hard to predict the order of the formal “worship” service. I know of a local church that has several campuses with each having their own worship band, but streams in the mega-senior pastor on huge life size screens to give the “unifying” message, all scheduled down to the minute. What has happened to spontaneity, diversity, and many gifted people participating in worship? Worship services revolving around “order of worship” or “order of song/chorus choices” in a tightly formed worship program or format appears very professional, meticulously formulated so that the lighting director, sound director, director of television production, director of Social Network streaming, and director of DVD production will all be on the same page at the same time as the worship team, designated participants and Senior Pastor on stage during the finely tuned scripted production, oops, worship “service”. When visiting different camps, sects, denominations, groups, etc. under the Christian banner, their services have striking similarities. Current “worship” songs fed by the Christian Music Industry now head the song lists replacing hymnals once placed in wooden pews. Secularly, country music has produced its own sound & style. Although Jimmy Hendrix lead guitar “fills” may no longer be popular, classic rock has its distinct sound. The program “American Idol” tried to find the right sound and image that American pop culture demanded. Now we even have our own “Christian worship” sound, style, and culture that stylistically is beginning to sound the same. I remember the birth of C.C.M, Contemporary Christian Music, because I am old! When birthed it was considered “alternative” Christian music, pushing the norms of conventional church hymns, organ arrangements, and choir cantatas. It had trouble finding stations that would “air” it, for secular stations were not open to “Jesus” music. I had to stay up to 11 p.m. on Sudnay night to listen to the Scott Ross Show on a local rock’n roll station to hear any Jesus, Contemporary music. As it developed into an industry, I remember prophets like Keith Green unpopularly challenging it! As we have “institutionalized” the Christian music industry, we have curbed if not destroyed spontaneity in a Christian “worship” service, and any “originality” of local unknown songwriters creating new music or being allowed to play their compositions in local churches. What ever happened to the “new song” propagated by the scriptures? As long as we look at worship structurally as part of the institutional system, it will continually look and sound professional at the price of spontaneity and originality. Worship teams look today as worship being basically “vertical” to God & Jesus, but they don’t think of it relationally. Very few Christian musicians work “horizontally” on relationships in their band, ensemble, or worship team. They claim to be relational, but the “worship leader” is the center of attraction and focus who leads, solos, and directs almost all the songs on the stage. “Background” singers are to augment the lead singer, the worship leader. Most of the time they don’t even sing harmony, and male singers, like good bass singers, are rarities. The Church stigma of male dominance even appears at the worship leader as men are usually the worship leader with women as “background” sisters, oops, singers! When watching a worship band on stage at most churches, what can we learn “horizontally” about relationships with in that music group or community? The same as the rest of the church, that it is pyramidal and hierarchal. Often the “worship leader” is professional “on staff” while volunteers are “volunteers”. Newer PostLINEAR WORSHIP AS RELATIONAL; CAN IT BE DONE? Older PostCONTROL: “GIVE IT UP”?